Five big banks to plead guilty to currency, interest rate manipulation, pay billions in fines. 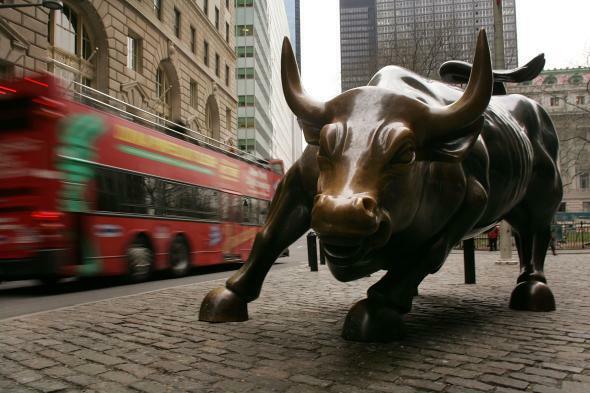 Taken for a ride: A tour bus passes the Wall Street bull in the financial district Jan. 22, 2007, in New York City. Well, this certainly isn’t going to win Wall Street any friends. Under a deal announced by the Justice Department on Wednesday, five major banks will plead guilty to manipulating global currency markets and interest rates, and will pay more than $5 billion in combined penalties as a result. None of the traders involved in the crimes, however, has been indicted. A fifth bank, UBS, was given immunity in that antitrust case, according to the Wall Street Journal, but will plead guilty to separate charges that it manipulated the London Interbank Offered Rate, or Libor, a benchmark interest rate that banks charge each other for short-term loans. The traders were supposed to be competitors, but much like companies that rigged the price of vitamins and automotive parts, they colluded to manipulate the largest and yet least regulated market in the financial world, where some $5 trillion changes hands every day, prosecutors said. The banks say they long ago dismissed most of their employees involved in the schemes. While none of the traders is facing prison time for their role in the crimes, the banks’ guilty pleas still offer something of a symbolic victory for federal prosecutors. Until now, most banks implicated in the numerous scandals since the 2008 financial crisis had avoided directly shouldering legal responsibility by forcing their smaller subsidiaries or specific banking units to plead guilty.